Because, seriously, Friday is still 2 days away. I love you, Wednesdays is my bloggin' attempt at a.) shutting up about my products and sharing the love of others' with others! and b.) sharing sources of inspiration that often stands behind my jewelry and creative process. It's been a great week here at the Bead Up house. For starters, last week's Fashionably Friday post got me some great "press." As usual, I posted the link to the new blog entry on both my personal Facebook and my Bead Up Facebook accounts. Within minutes of posting the entry that features Project Runway's Korto Momolu, I got a status update letting me know that Korto herself "liked" the blog post! I immediately friended her on Facebook (it was the real her) and she accepted. And if it couldn't get cooler, I noticed that some of my blog traffic was coming from HER professional website - turns out she listed my blog entry as the first listing of "PRESS" reviews on her website! Holy moley - the power of Facebook (I still am determined to one day do a blog entry on how Facebook has been vital to my shop's success)! Check out Korto's press section of her website here! And to add to the coolness, I e-mailed her on Facebook thanking her for the feature and asked if she bought beads online and if so, where. Here is what she had to say: "I actually get some cool bead finds on amazon. But I am a touchy feely kinda girl so I stock up everytime I go to nyc. Littlerock has really great bead stores too, that's where I still live. Loved the post and I always show love for my positive bloggers! U will def love my new collection of jewelry since it pays homage to my pr finale pieces so I will let you know when I load them. It'll be right before pr allstars. Thanks again and let's stay in touch I'll keep a lookout for beadsites for ya. ~Korto" Doesn't get any cooler than that, my friends. Ahhhh... Though the good vibes keep rolling in. The giveaway I hosted with Today's Giveaway a few weeks ago went really well, and one of my previous customers won the pair of earrings! Karen even went as far as to write a glowing review about the earrings she won on her own blog - be sure to check it out (thanks, friend!). Since finding Today's Giveaway and other similar sights I have taken a liking to entering every giveaway I can find that offers products I dig. Well, wouldn't you know, I won 2 giveaways this week! 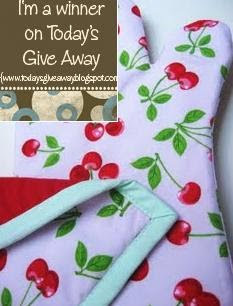 The first was from the website in which I held the giveaway just days earlier - turns out I won an oven mit and potholder set from the super cute shop "The Cherry on Top." Sweet! 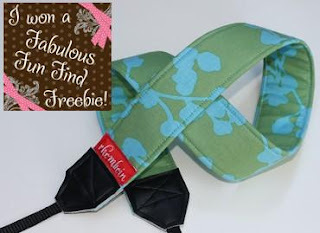 And if that couldn't get any better, I got an e-mail yesterday telling me that I won yet another giveaway, this time on Fabulous Fun Finds' giveaway blog! I am actually thrilled I won this one because I was very tempted to buy the item anyway - it's a camera strap! And not any camera strap - but a Amy Butler fabric camera strap! Great prints + photography + free = LOVE! I am actually in love with Amy Butler's prints. Maybe even in lust. I swear, this women knows both color and the history of floral prints, as she has MASTERED pulling them all together without going the tacky 60's route. I am beyond inspired every time I see her print in use - she forces me to re-think color combination and even manages to make pastel pink HOT! Her website itself is inspirational, as she makes a point to include an INSPIRATION section filled with pictures and photo shoot snapshots. Additionally, her site also includes FREE downloadable sewing and craft patterns to be used with her beautiful printed paper and fabric. It's love. Let's see - Eye Spy a baby blanket, a crayon rollup, a kitchen towel, and iPod holder, and a pot holder! Make sure you visit their Etsy shops for Amy Butler amazing-ness! Great blog. Thank you so much for featuring me in it. Great blog today. Very upbeat. 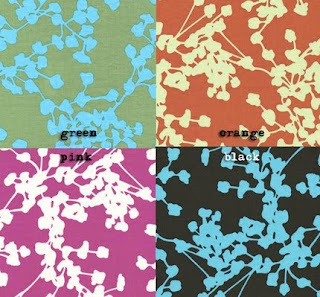 I also love Any Butler's fabric. Beautiful. Great post! I would love to have a day like that.